Business Analysts analyse the business domain and assess the business model to help the organisations improve their processes and systems. They act as a bridge between business problems and technology solutions. They communicate with the Subject Matter Experts (SMEs) and stakeholders to understand their problems and requirements. The role requires to gather, document, and analyse the business requirements and problems for conducting research and analysis, to provide solutions to the organisation. Business Analysts carry out research and analyse data to develop their knowledge about how a company operates and strategize the techniques to improve the company’s processes and practices. The main objective of this role is to help an organisation increase its profitability by providing technology solutions to its problems. The role of Business Analysts may be seen as a technical position and based in the company’s IT department. The implementation of solutions provided by them may include new or improved computer systems. Business Analysts help with the implementation and support of business information systems across departments. They recognize problems and opportunities within a company and provide solutions that help attain the business’ objectives. They work together with financial reporting and IT teams to develop initiatives and strategies that optimise costs and improve internal and external reporting. Business Analysts can work on projects with Analysts or consulting firms. Some of their typical employers are Specialist Business Analysis Firms, Consulting and Professional Service Firms including technology consulting companies, Public Sector Organisations, Technology Companies, and Research Firms. While working with these firms, they will either travel to the project site or move to the place where the project is based, mostly if the project duration is long. The projects may be short or long term depending on whether the Business Analyst is only providing the solutions or assisting with their implementation as well. Business Analysts are also employed by larger organisations that require in-house analysts- such as banks, utility firms and multinational companies etc., in which case they exclusively work for their employers. 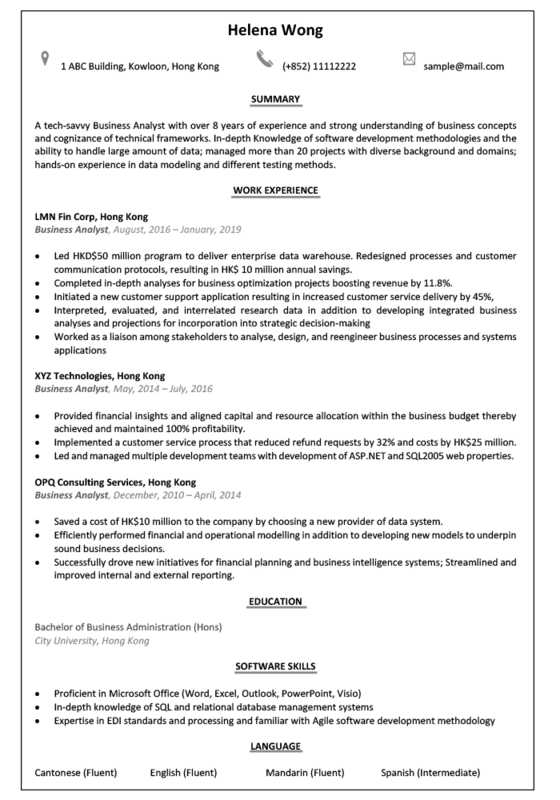 Experienced Business Analysts may also work independently in a freelance capacity. The alternate job titles for this role can be Business Systems Analyst, Process Analyst, Enterprise Analyst, Business Architect and Functional Analyst. Highlight your business analysis accomplishments in addition to your current position, years of experience and key skills in the summary statement. Make sure that these details match the job description to convince the hiring manager that you are qualified for the position you are applying. Sharing numeric data is a good way to catch the attention of a recruiter. A tech-savvy Business Analyst with over 8 years of experience and strong understanding of business concepts and cognizance of technical frameworks. In-depth Knowledge of software development methodologies and the ability to handle large amount of data; managed more than 20 projects with diverse background and domains; hands-on experience in data modeling and different testing methods. Be honest about the skills and experience you include and highlight in your resume. Organize your resume in such a way that it presents your experience and qualifications in the best possible manner. Describe how you used a business analysis skills and achieved something significant by applying those skills. Quantify your accomplishments and highlight the specific outcome or benefit to your employer. For example- Successfully implemented new technology and systems that resulted in increased profitability by 60%. Or Saved HK$10 million in costs by choosing a new provider of data system. Give details if you have run or facilitated any workshops and training sessions. Emphasize on your understanding and knowledge of regulatory & reporting requirements as well as key performance indicators. Use key words like analysis, profitability, budgeting, forecasting, planning, financial modelling, variance analysis, pricing etc. Led HKD$50 million program to deliver enterprise data warehouse. Redesigned processes and customer communication protocols, resulting in HK$ 10 million annual savings. Provided financial insights and aligned capital and resource allocation within the business budget thereby achieved and maintained 100% profitability. Implemented a customer service process that reduced refund requests by 32% and costs by HK$25 million. Led and managed multiple development teams with development of ASP.NET and SQL2005 web properties. Saved a cost of HK$10 million to the company by choosing a new provider of data system. Efficiently performed financial and operational modelling in addition to developing new models to underpin sound business decisions. Successfully drove new initiatives for financial planning and business intelligence systems; Streamlined and improved internal and external reporting. Use the right key words, terminology, and most relevant skills in your CV. For this role, It is important to have a clear understanding of business objectives along with the ability to interpret directions. Some of the must-have traits to be a successful Business Analyst are impressive verbal and written communication skills; stakeholder management and the ability to run stakeholder meetings; critical and analytical thinking; strong technology, excellent presentation, time management, and problem solving skills. In addition to MS Office, mention your knowledge and experience in other technical tools or programs used for modelling, prototyping, and reporting etc. Show the hiring manager that you are skilled at the technology they are using. 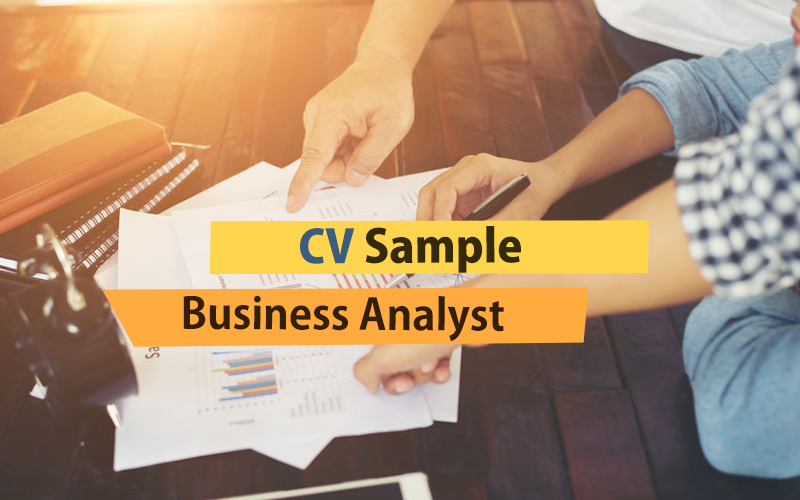 Most Business Analyst positions require candidates to have a bachelor’s degree in Business Administration, Finance, or Accounting for entry-level positions. There are also a number of industry-recognised certificates aspiring Business Analysts can acquire. It is always advantageous to earn a Master’s degree or obtain an advanced certificate. 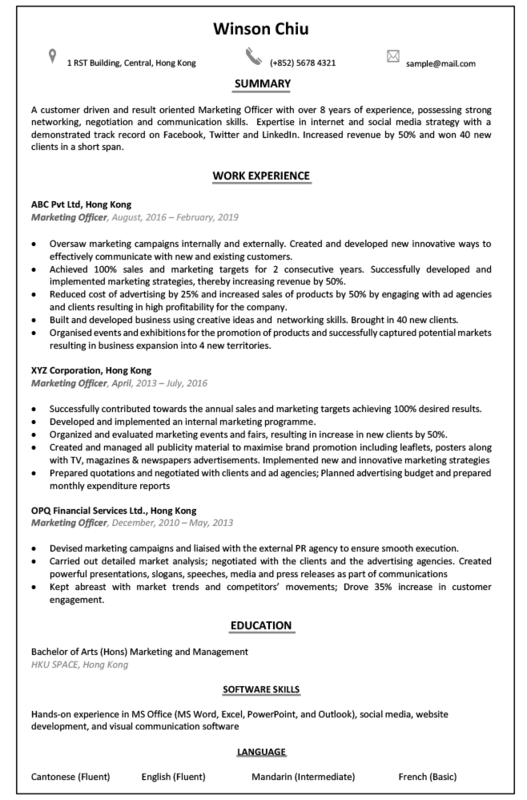 Posted in Guide to the Perfect Resume, Job Hunters by jobsDB editor on March 24, 2019 .